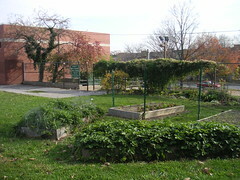 Barclay Elementary/Middle School has an active Green Team, a schoolyard garden and an environmental justice class for Middle School Students. Among the school's partnerships in this effort are Parks & People Foundation, JHU Center for Social Concern, and Greater Homewood Community Corporation. Its entrance is enlivened by “Honoring History with Art” – a mosaic mural created by community members, students, parents, and staff under the guidance of Community Artist Tamara Payne, Abell resident Jo Ann Robinson, and Greater Homewood Community Corporation. Our 5th grade class is making a green map! Barclay School is an important place because it is green and it’s just a clean area. It is good for the environment because it has a beautiful garden to see and a place for children to relax and learn. 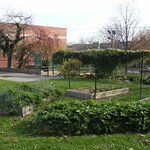 I like the Barclay School because this school loves to be green. I was inspired to draw a picture of the Barclay School because it’s a wonderful place to learn and it’s one of the best green schools because the gardens look terrific. The new mosaic at the front of the school is BEAUTIFUL!!! !